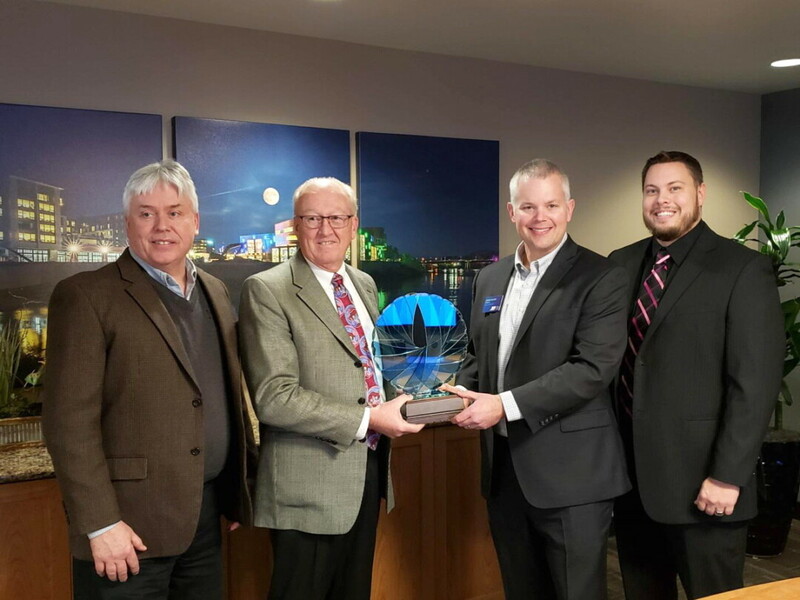 Market & Johnson received the Paragon Award from the Eau Claire Area Economic Development Corp. earlier this month. From left to right: M&J President Jerry Shea, M&J CEO Dan Market, RCU President and CEO Brandon Riechers, and Eau Claire Area EDC Executive Director Luke Hanson. You’re forgiven if you didn’t realize that Market & Johnson’s headquarters is on Galloway Street in Eau Claire. After all, those of us who live in the Chippewa Valley are used to seeing their name everywhere. Banners emblazoned with “Market & Johnson” have hung all over the Chippewa Valley – and beyond. In the past few years alone, passersby have seen the M&J name and logo on the Pablo Center at the Confluence, Eau Claire City Hall, Haymarket Landing, Eau Claire Fire Station No. 10, the new Altoona Elementary School, and the Jamf office and Royal Credit Union headquarters in downtown Eau Claire. These are just a handful of the civic, commercial, educational, industrial, manufacturing, and housing projects that Market & Johnson has worked on in Wisconsin and eight other states. And 2018 brought another big project for Market & Johnson: the renovation of, and addition to, its own headquarters at 2350 Galloway St. The more than $5 million project including an 18,000-square-foot addition plus the renovation of about 9,5000 square feet of office just and nearly 30,000 square feet of warehouse and storage space. These projects and countless others over the company’s 71-year history helped Market & Johnson earn this year’s Paragon Award from the Eau Claire Area Economic Development Corp. The award, which honors businesses’ economic impact on the Chippewa Valley, has been given out annually since 2001, when RCU was the first recipient. RCU now sponsors the award. “Market & Johnson has made a significant impact by focusing on projects that make our community a better place to live and work now and will continue to benefit generations to come,” said Brandon Riechers, president and CEO of RCU, who presented the award earlier this month. Dan Market, the company’s CEO, said Market & Johnson was honored to received the award, but that it isn’t the kind of company that goes looking for awards. “It’s really a credit to all of the employees that make us where we are today,” he said. In addition to about 60 office staff, Market & Johnson employs as many as 425 people in the field during the peak of construction season. It is western Wisconsin’s largest contractor, with $400 million in annual construction volume. But considering its mission statement – “Adding value to everything we do” – Market & Johnson doesn’t focus solely on getting bigger, Market said. “We don’t try to grow just to grow,” he said. “If you go out and do a good job for your customers, the customers will make the growth happen.” On the other hand, he added, trying to expand too fast can make a company lose touch with its customers. 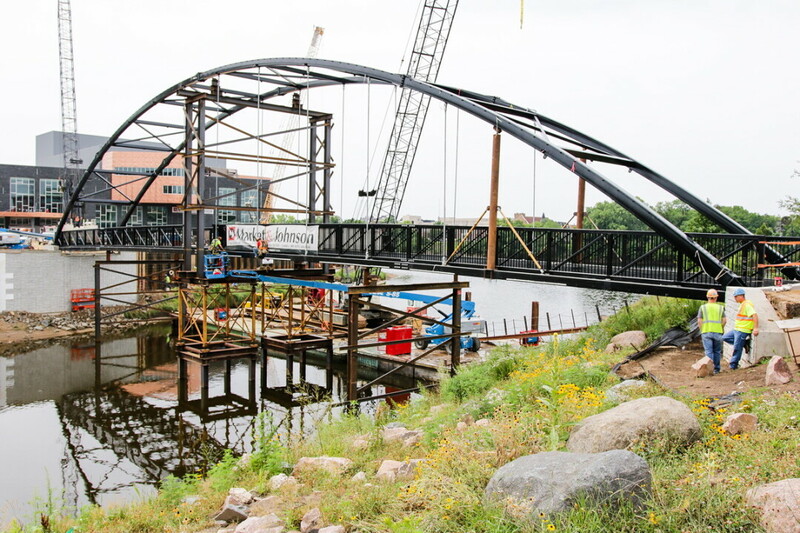 workers installed the confluence crossing pedestrian bridge las summer across the eau claire river in downtown eau claire. market & johnson served as contractor for construction of the The bridge as well as for the Pablo center at the confluence behind it. Community members nominate businesses for the Paragon Awards, and nominees are judged on criteria that include creating jobs, expanding existing facilities, increasing tax base, training workers, supporting economic development in the community, and developing new technologies or products. Past Paragon winners include Artisan Forge Studios, Jamf, Action City, Menards, CURT Manufacturing, Bush Brothers, Dove Healthcare, Indianhead Foodservice Distribution, and Dynamic Fitness and Strength. Market & Johnson was founded in 1948 by Milt Johnson and Juel Market, father of current CEO Dan Market. Originally homebuilders, Market & Johnson got into commercial construction in 1952, building Altoona High School. By 1956, they transitioned entirely to commercial building. In addition to its main office in Eau Claire, Market & Johnson has offices in La Crosse and Oakdale, Minnesota. While the firm’s main focus is western Wisconsin, it has worked on projects in nine states, ranging from a police training center in St. Paul to the Menomonie Market Food Co-op to sand-processing plants in Texas and Oklahoma. While Market & Johnson has built theaters as part of school and university projects, the Pablo Center was its first full-scale arts center. “It’s been a lot of fun,” Market & Johnson President Jerry Shea said of working on such a high-profile project. Shea said that the headquarters addition and renovation was long overdue. The company had grown, but its offices hadn’t, and every available space was being used. The company’s board assigned Shea and Market to seek potential sites for a new office, and while they studied 33 of them, they ended up concluding that the company was best served by growing at its current location. The spot is near downtown Eau Claire – site of many of Market & Johnson’s recent projects – as well as near the company’s storage yards. But its also near a bike and pedestrian trail and other amenities the firm’s employees use. Naturally, Market & Johnson renovated its own headquarters, giving workers a firsthand view of the construction process. “We really enjoyed having the office employees live through what we do to our clients,” Market said. Learn more about Market & Johnson at market-johnson.com and about the Paragon Awards at www.eauclaire-wi.com/services/paragon-award.